Check out the news release and the video for this new book! 1. Algebraic and analytic methods Ranjan Roy, Frank W. J. Olver, Richard A. Askey and Roderick S. C. Wong; 2. Asymptotic approximations Frank W. J. Olver and Roderick S. C. Wong; 3. Numerical methods Nico M. Temme; 4. Elementary functions Ranjan Roy and Frank W. J. Olver; 5. Gamma function Richard A. Askey and Ranjan Roy; 6. Exponential, logarithmic, sine and cosine integrals Nico M. Temme; 7. Error functions, Dawson's and Fresnel integrals Nico M. Temme; 8. Incomplete gamma and related functions Richard B. Paris; 9. Airy and related functions Frank W. J. Olver; 10. Bessel functions Frank W. J. Olver and Leonard C. Maximon; 11. Struve and related functions Richard B. Paris; 12. Parabolic cylinder functions Nico M. Temme; 13. Confluent hypergeometric functions Adri B. Olde Daalhuis; 14. Legendre and related functions T. Mark Dunster; 15. Hypergeometric function Adri B. Olde Daalhuis; 16. Generalized hypergeometric functions and Meijer G-function Richard A. Askey and Adri B. Olde Daalhuis; 17. q-Hypergeometric and related functions George E. Andrews; 18. Orthogonal polynomials Tom H. Koornwinder, Roderick S. C. Wong, Roelof Koekoek and Rene F. Swarttouw; 19. Elliptic integrals Bille C. Carlson; 20. Theta functions William P. Reinhardt and Peter L. Walker; 21. Multidimensional theta functions Bernard Deconinck; 22. Jacobian elliptic functions William P. Reinhardt and Peter L. Walker; 23. Weierstrass elliptic and modular functions William P. Reinhardt and Peter L. Walker; 24. Bernoulli and Euler polynomials Karl Dilcher; 25. Zeta and related functions Tom M. Apostol; 26. Combinatorial analysis David M. Bressoud; 27. Functions of number theory Tom M. Apostol; 28. Mathieu functions and Hill's equation Gerhard Wolf; 29. Lamé functions Hans Volkmer; 30. Spheroidal wave functions Hans Volkmer; 31. Heun functions Brian D. Sleeman and Vadim Kuznetsov; 32. Painlevé transcendents Peter A. Clarkson; 33. Coulomb functions Ian J. Thompson; 34. 3j,6j,9j symbols Leonard C. Maximon; 35. Functions of matrix argument Donald St. P. Richards; 36. Integrals with coalescing saddles Michael V. Berry and Chris Howls. "The NIST Handbook is a handsome product, with large pages and large type. The book is quite heavy; for convenience, one might be inclined to place it on a stand, as with an unabridged dictionary. The book contains numerous graphics, almost all in color. References and cross references to books and articles abound. Applications to both the mathematical and physical sciences are indicated. The NIST Handbook is indeed a monumental achievement, and the many, many individuals who participated in its creation and dissemination are to be congratulated and thanked." 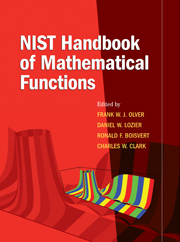 "An outstanding group of editors, associate editors and validators updated and extended the classic NBS Handbook of Mathematical Functions, edited by Abramowitz and Stegun. The National Institute of Standards and Technology (NIST) and Cambridge University Press are to be congratulated for publishing a treasury. It is eminently readable with clear, sharp, high-contrast text, mathematical notation and colored graphs and figures, The entire book is contained in a CD-ROM with a searchable PDF. From Leibnitz to Hilbert, from modern science and engineering to other disparate fields of study, functions are ubiquitous , fascinating and beautiful objects of human ingenuity. A prerequisite to their use is to understand their properties, and this handbook provides a direct and concise solution. It contains an extensive bibliography, a list of notations, and an index. The general format for each group of functions includes notation, properties, applications, computation and references. People who work with functions will delight in this handbook." "This is like trying to review the bible: it would be eccentric to argue that it is not a “thoroughly good thing”. It’s the modern successor to the wonderful Handbook of Mathematical Functions, edited by Abramowitz and Stegun, and maybe that’s enough said. In summary, this splendid work doesn’t really need the approbation of a mere reviewer. And now I’m off to look up my first unidentified integral to see if it’s a standard form." "The editors, associate editors, chapter authors, validators, and NIST staff members deserve our thanks for their very successful and valuable product." "NHMF and the online version DLMF are a treasure for the mathematical and scientific communities, one that will be used and valued for decades. The organization, presentation, and general appearance are excellent. This beautiful book reflects credit on everyone and every organization involved; NIST; the National Science Foundation for funding; those who organized the project and obtained the funding; the advisors, editors, authors, and validators; and Cambridge University Press. Above all, NHMF and DLMF are a monument to the efforts of the editor-in-chief, author of one chapter of A&S and author or coauthor of five chapters of this successor volume, Frank Olver."